In 1970, while his case was still on appeal, Ali was allowed to fight again. With the help of a State Senator, he was granted a license to box in Georgia because it was the only state in America without a boxing commission. In October 1970, he stopped Jerry Quarry on a cut after three rounds. Shortly after the Quarry fight, the New York State Supreme Court ruled that Ali had been unjustly denied a boxing license. Once again able to fight in New York, he fought Oscar Bonavena at Madison Square Garden in December 1970. After a tough 14 rounds, Ali stopped Bonavena in the 15th, paving the way for a title fight against Joe Frazier, who was himself undefeated. 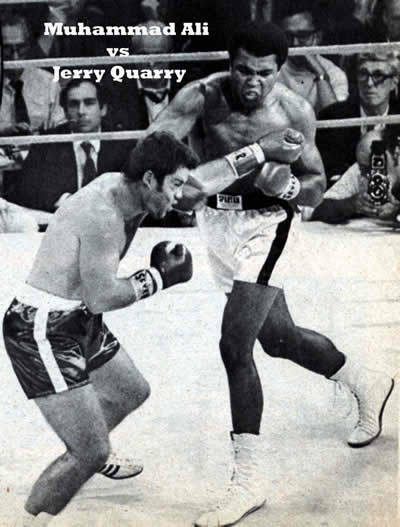 Quarry fought on, winning six of seven bouts before facing Ali in 1970 at Atlanta. He was stopped on cuts in three rounds. After six more wins, he battled Ali again in 1972, and was halted on cuts in the seventh at Las Vegas. During his forced exile from boxing even Muhammad Ali had doubted that he would enter the ring again. Ali was under no illusions about the task taht now faced him. If he lost he would have to listen for the rest of his life the bad things the press would write about him. Facing Ali was Jerry Quarry, a rough and tough white Heavyweight who had known plenty of hardship in his life. Quarry was not intimidated by Ali or the crowd and for the first time Ali entered the ring against a younger man than himself and one who was more than capable of winning the Heavyweight Title now held by Joe Frazier. Plenty of people had advised Ali to take an easier fight on his return, yet their fears looked unfounded as Ali set about Quarry from the opening bell like the dancing master of old, circling and flashing out his jab. For the opening three minuted it seemed like the years outside of the ring had left Ali unscathed. But in round two Quarry, a pressure fighter, bore in woth some solid body shots that forced Ali onto the ropes where he seemed content to stay. It was a tactic Ali would contine to use in his return from exile. Even in the third round, Ali got the better of a close exchange of infighting. When Quarry stepped back, there was a deep cut above his left eye. The referee, Tony Perez, halted the bout when the cornermen could not close the cut between rounds three and four. Quarry was bitterly disappointed and rushed towards Ali to be stopped by Drew Bundini Brown. Muhammad Ali's comeback fight had raised more questions than it had answered.